If you haven't yet come across the brand DHC then 'HELLO' you need to. This month there are two amazing new launches and you basically need them. DHC, which stands for "Daigaku Honyaku Center, are a Japans No. 1 direct skincare company and their Cleansing Oil is a product most people are possibly more familiar with. The vision behind DHC is rooted in the beneficial properties of virgin olive oil, Flor de Aceite – the finest quality, extracted from organic Spanish olives. The entire skincare range was founded on the beneficial properties of olive oil. Rich in vitamins and antioxidants, it is a highly effective component in neutralising damaging free radicals. Olive oil also helps balance your skin's moisture. With its unique ability to mix with water, olive oil helps moisturise without clogging pores. So with THREE amazing new launches in the form of a Q10 Face Mask, the Quick Film Smoother and the Gel Pencil Eyeliner EX it is quite an exciting time. The Q10 Face Mask is a sheet mask that features antioxidant coenzyme Q10 which is a powerful antioxidant which exists naturally within the body but within this mask, it helps to firm and fight free radicals as well as helping to target fine lines, wrinkles and elasticity loss. With key ingredients such as Vitamin C and E which help to brighten and hydrate, collagen and sodium hyaluronate which help to plump fine lines and wrinkles. As with any mask that you are using, you should apply to a cleansed face to ensure all that surface dirt and grime is removed and then leave on for up to 20 minutes before removing, once removed press any of the remaining treatment into the skin with simple tapping motions. At £4.50 (here) these masks are worth every penny for that soft, smooth, hydrated and clean feeling skin. The Gel Pencil Eyeliner EX available in shade black or brown is a product that never seems to be on my list of 'must haves'. I do wear eyeliner occasionally but I have to be in the right frame of mine to attempt to apply it, otherwise, I get annoyed when the application doesn't go quite right. Whether you like your eyeliner to be barely there or if the old cat eye with perfect wing is for you, DHC have created this non-smudge eyeliner which is as precise as a pencil but has the smoothness of a gel and all I am going to say is that this does not budge one each, even with a hand swatch! The colour which is super pigmented stays true to colour and creates a line in just one stroke, so you won't need to sit for hours in front of the mirror going back and forth across your lash line to see a bit of colour. Designed in a twist up pencil format, so no need for sharpening, these pencils are priced at £9.50 (here) and basically one of each is needed. The final product to share with you is the Quick Film Smoother and it is described as being a lightweight moisturiser which smooths out the look of wrinkles instantly. It houses some amazing ingredients such as collagen-rich eggshell membrane (ESM) peptides alongside a combination of algae extract which instantly firm the appearance of the skin and support collagen levels. Sodium hyaluronate protects the skin's natural moisture levels and soybean protein complex works over time to protect the skin's natural elasticity. Put them all together and you get a more youthful-looking glow. It works great as a primer for your makeup and instead of covering my entire face with the cream, I tend to stick to between my brows, around my eyes and around my lips and sometimes on my cheeks. I absolutely love this and as a Primer, it is simply amazing, my makeup doesn't slide off point way through the day and because it is so lightweight, I don't feel as though I have anything on my skin. Priced at £17.50 (here) in the DHC sale so grab it quick, this is a product I adore. Seriously though if you have never come across DHC products before then you need to give them a look, I have featured so many amazing products on this blog and you can find some of them right here on the DHC Website, where there is a sale! I love discovering new brands, these sound amazing, especially the face mask. I definitely need the Q10 Face Mask and the Quick Film Smoother in my life! I haven't heard of this brand before, but both of these products sound amazing and I seriously need something to deal with the fine lines around my eyes and mouth. I've never heard of DHC but after reading your post I'm definitely going to go and check them out. I love the look of the face mask. 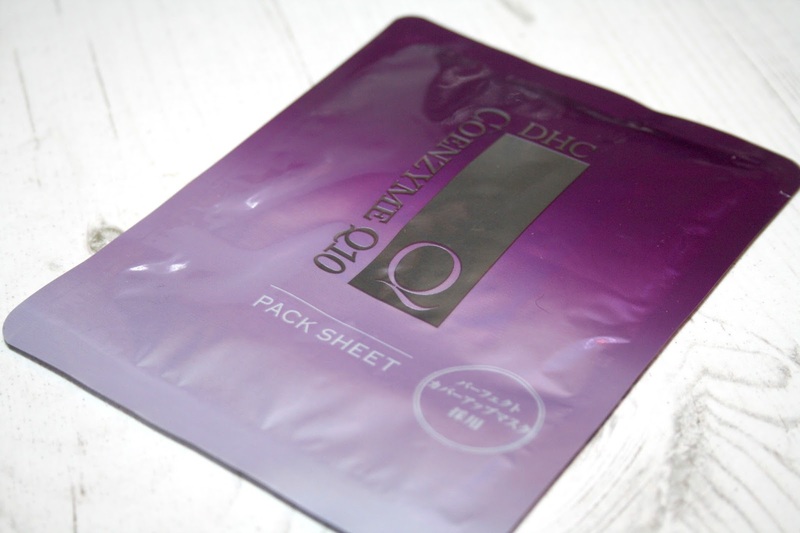 I have actually wanted to try a sheet mask with Q10 for ages as it is so for the skin. Off to view! oo that sheet mask looks good! I will deffo have to check these out! Love discovering new brands, and I've never tried a sheet mask before, so I'd love to give that a go! I love DHC! I've never tried that primer though so I need to get my hands on it! I love the sound of the sheet masks, a decent price too.